After a full seven-game series and a final 5-1 victory on Wednesday, the Houston Astros are officially the 2017 World Series Champions. (Cue Queen.) Naturally the Astros faithful want that victory afterglow to last as long as possible, and there's no better way to sustain the thrill of the fight than watching the massive Houston victory parade take place this Friday. When is the World Series victory parade? 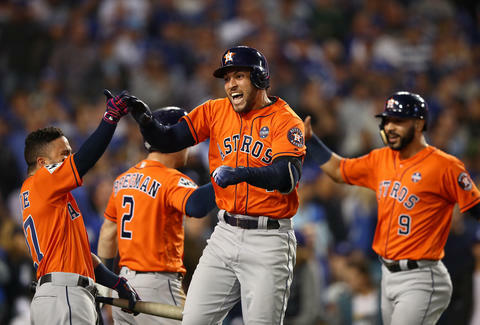 World Series MVP George Springer, likely NL MVP José Altuve, ace Justin Verlander, and the rest of the Astros will begin their victory tour on Friday, November 3 at 2pm Central Time (3pm Eastern). The parade will include floats carrying the players, confetti blasted from more than a dozen buildings and, of course, Astros mascot Orbit. "Let's have the largest championship parade that's ever been seen in the state of Texas," Houston Mayor Sylvester Turner, who hopes more than 750,000 people will show, said at a news conference Thursday. "Let's show up in a major way." The parade will begin on Smith Street at Lamar Street, head north on Smith, east on Walker Street, south on Milam Street, west on Pease, north on Smith, and end at Lamar, according to ABC 13. Basically, it's a big rectangle. And don't forget the after-party/rally for the Astros at City Hall. The parade route is closing to car traffic by 1pm, so it'd be a good idea to get down there around then and stake out a spot around the perimeter of the map above. Milam Street is easily the longest stretch of the parade without a turn, so finding a spot along the road there might be a safe bet. Check here for parking spots. Know, however, that in the aftermath of Hurricane Harvey, many parking garages are still unusable. Officials are urging parade-goers to take the METRORail or other forms of public transportation. You can watch the parade on TV via the MLB Network channel or online via live stream on MLB.com (you'll need a cable login, though). Even if you do not plan on watching the World Series parade, you can still get in on the fun and celebrate the Astros' big victory. A bunch of restaurants and stores are offering food freebies and deals in honor of "Houston Astros Day." FM Kitchen and Bar is offering half-price burgers and deals on hot dogs and beer, Papa John's is giving out half-priced pizza Saturday with the promo code "Astros," James Coney Island Grill has a $1 dollar hot dogs deal Friday and Antone's is discounting their famous po-boy. Check out KHOU's full list to make sure you don't miss out. James Chrisman is a News Writer at Thrillist who has seen baseball before. Send news tips to news@thrillist.com and follow him on Twitter @james_chrisman2.